the office of his Fatah movement in Beirut’s Shatila Palestinian refugee camp. Posters of Abbas  president of the Palestinian Authority, leader of Fatah and chairman of the Palestine Liberation Organization  would normally hang in offices and on street corners throughout Lebanon’s 12 Palestinian refugee camps. But ever since Israel’s incursion into Gaza earlier this year, Abbas has become politically radioactive to the approximately 400,000 Palestinian refugees languishing in Lebanon, who were livid at his failure to act in defense of the beleaguered Gazans. “Abbas embarrassed us,” says one Fatah official charged with delivering Abbas portraits in the camp. “Sometimes we force people to take the posters [bearing his portrait] but they never put them up.” But Abbas may be about to lose a lot more than pride of place for his portrait in the seething refugee camps. The stack of unused Abbas posters is but a symptom of the collapse of support for Fatah in Lebanon, home to the most politically active population of Palestinians outside of the West Bank and Gaza. It was the movement’s traditional support there that underscored Abbas’ mandate, as chairman of the PLO, to negotiate on behalf of all Palestinians. 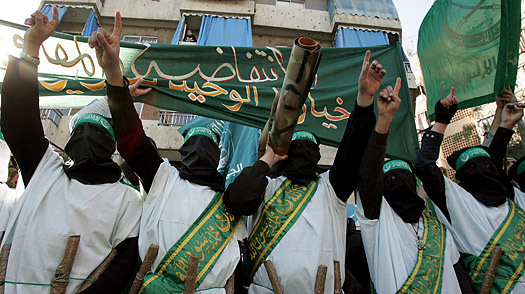 But the failure of Abbas’ negotiation strategy to deliver any meaningful change in the prospects of Lebanon’s Palestinian refugees has led many  like their kin in the West Bank and Gaza  to transfer their support to Hamas and other radical Islamist groups. The refugees of Lebanon have always been more militant than their brethren inside Palestine. Most are descendants of those who fled Israeli forces in Galilee during the war of 1948, and have ever since been prevented by Israel from returning to their homes. Having lived for six decades without citizenship or basic civil rights in the squalor and despair of refugee camps in a country that bars them from owning property and from entering some 70 different professions, they have long provided a fertile recruiting environment for militant groups.